*In Construction* Special Ops Project Gonell. Updated by Senior Technician Agent C and Double 0. Operation Gonell is now in Mechanical Operation. Our team is camped on the North-West corner of Bloor St W & Royal York Rd, Etobicoke. You might have seen our black and white Ford Transit vans parked outside. You might have seen us sippin’ on espressos or checking out your english bulldog. Operation Gonell is the most exciting current renovation to happen in this neighborhood, straight up. The local, ambitious, and talented builder/remodeler Will Gonell, makes his centre stage debut back into the Kingsway area. Spending four years away in other Toronto neighborhoods – building highly detailed custom homes – he comes back with a National Award under his belt and a fresh insight into how your home can be built. Update 1: October 30th, 2017. 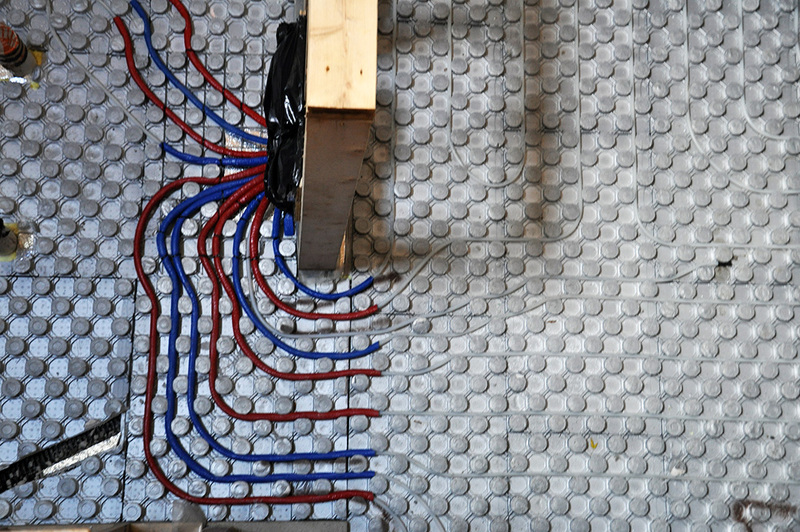 Today we’ve started to “rough-in” a future radiant floor warming system. The process begins once your gravel base is raked level and waterproofing is done. 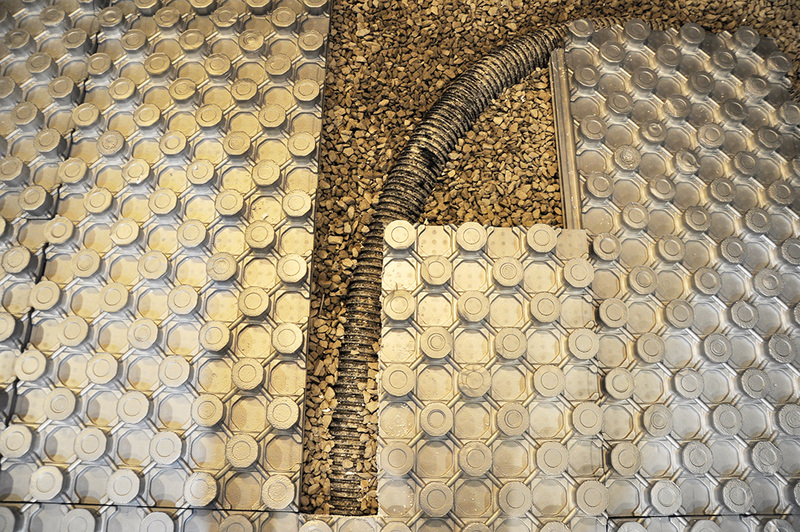 It consists of installing special insulation atop the gravel, and then piping on top of the insulation. 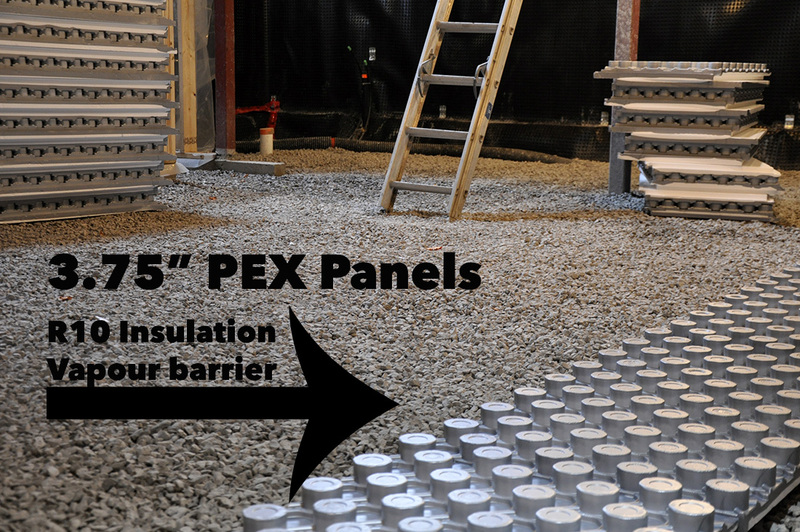 We call the insulation “PEX Panels” because they come in 2×4′ sheets and have round “pucks” where your PEX piping gets pressed between. They click together to form a solid layer or “insulation system” before you pour the concrete. We will then install a system of tubing that will carry hot water for heating. The height of these PEX panels is greater than the standard styrofoam sheet your uncle layed in his basement and you had to help him on that one Saturday. You really didn’t want to do it because you had a party in Brock the night before, but cutting off the tips of 800 zip ties made it all worth it. The reasons to go with a 3.75″ tall panel are simple: 1. 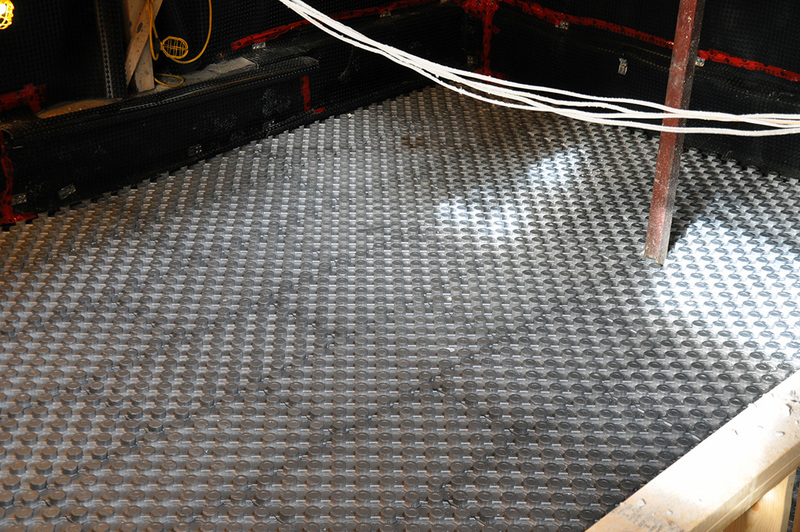 When radiant heating is your primary source of heat, the basement slab must have a minimum R10 insulation rating. 2. 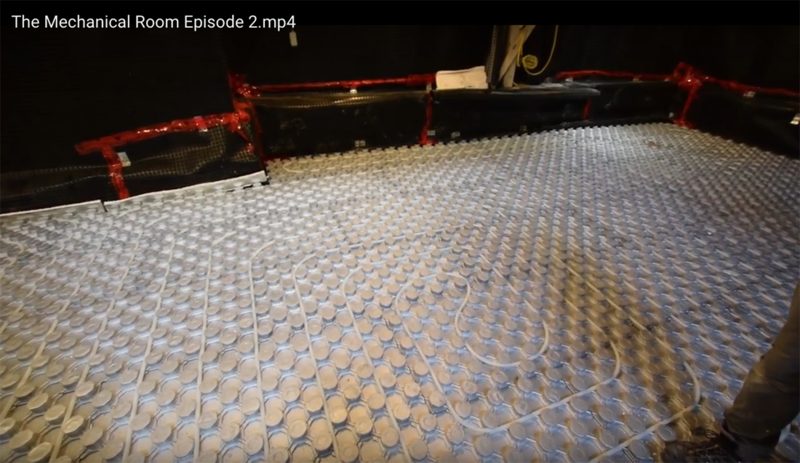 After switching to this method of pressing the PEX inside the “pucks” and not zip-tying on top, it greatly reduced the amount of punctures we had during the concrete pouring process. Your basement gravel base will never be perfectly clear of all pipes from drains, radon systems, or weeping tile. We carry rakes, shovels, and a meticulous eye for dangers. Most of these can be worked around, then any small gaps and cracks are filled with foam. October 31st, 2017 Update – Happy Haloween! 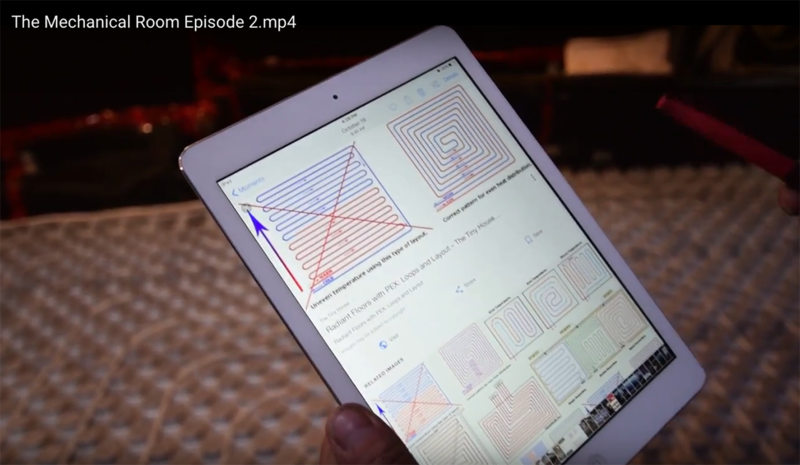 If we want you to stay on this blog then you need to know how a hydronic radiant heating loop works. The embedded tubing will be the highway in which water will flow underneath the entire concrete slab. When using 1/2″ tubing (standard) you’re only allowed a certain length before pressure will be lost and won’t return back. Stagnant water like your son’s stinky socks he leaves behind is no good here ok?? What to do when you reached your maximum limit but still have more basement to cover? You end up with loops. A total of six loops in this basement connect to a manifold/collector, or distribution centre. You now understand that water needs to supply and return from loops going into something called a manifold. Brilliant! You’re a Grade A genius now, *in a Jeremy Clarkson voice* Quick, go tell your mom before you forget. Then come back and keep reading. True Story: On Orest’s day first day back from his 2017 Euro Tour Pt.2, he invited Agent C to The Yellow Cup Cafe in Etobicoke. Whilst eating their delicious sandwiches and having secret conversations, a German home renovation magazine finds itself onto the table. 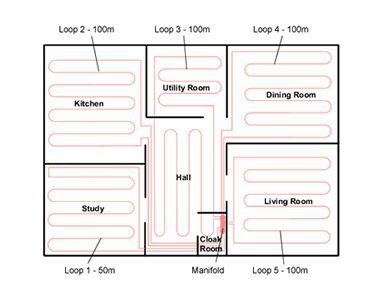 Orest goes on about how a reverse return loop layout should be the only way to go when installing floor heating. I kid you not. They both agreed – and the rule became from now on – to install reverse return heating loops every time! 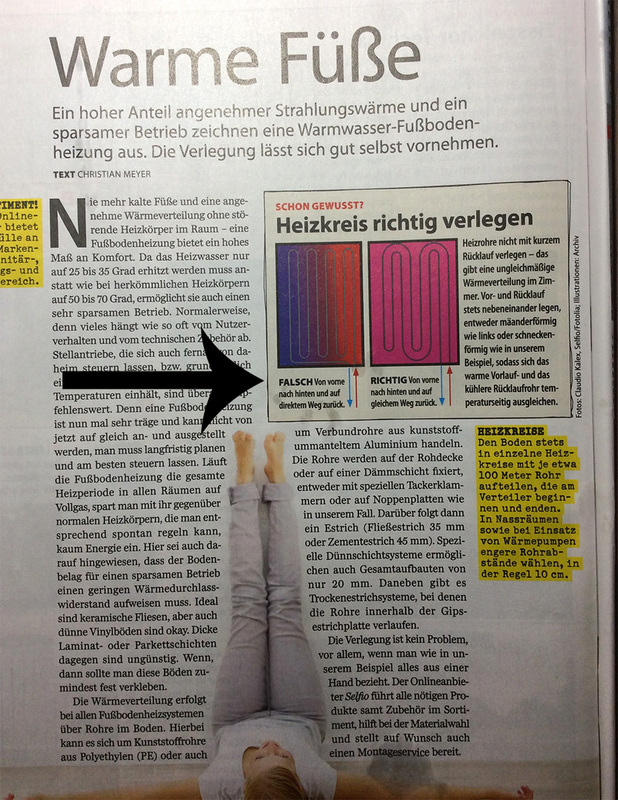 Here is the page from the article. Notice where the arrow is pointing. Normally you would run your loops up and down the room until you’re done. FALSCH! You could do better. 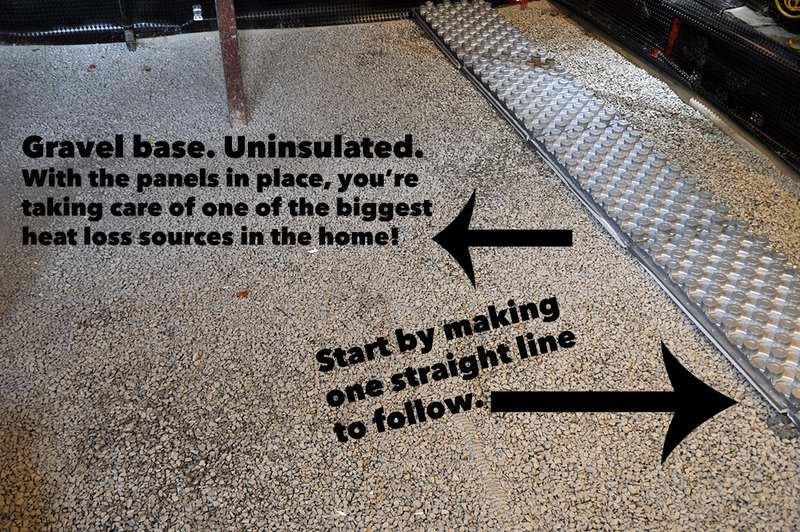 A reverse return layout method distributes the heat evenly across the slab. It achieves more comfort, and it looks hot like your ____? All the European heating instagramers do it this way and girls seem to like my style. This is one step towards building better Mechanical Rooms and gaining higher performance. So lets go buy some PEX, plan some loops, get layed, and have a party!